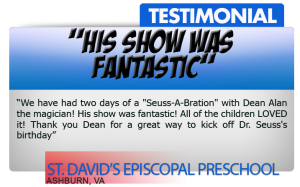 Virginia Magician Dean Alan Will Transform YOUR Event Into An Unbelievable Spectacle of Laughter and Entertainment! For two decades, Dean Alan has been conjuring up smiles, laughter, and looks of amazement, on the faces of kids and adults all over the Washington D.C. area (and beyond). Thousands of shows equals hundreds of thousands of happy people who have experienced his special brand of magic. 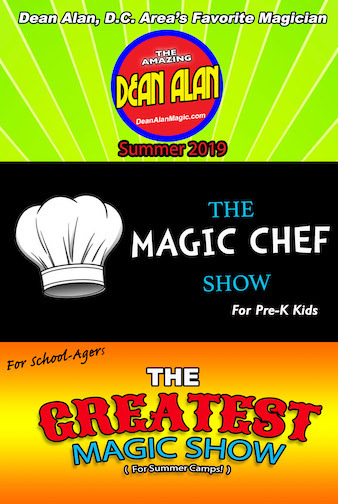 Dean Alan offers two types of shows, themed magic shows, and fun magic shows. Don’t get us wrong, ALL THE SHOWS ARE FUN, but some have specific themes, like Dr. Seuss/Reading, Dinosaurs, Holidays like Thanksgiving & the Winter Holidays. The show page has a full list of all the available shows. You’ll find many shows with themes, in fact he has a different themed show almost every month of the year. And he does non-themed magic shows for other events that are just as unique and interesting! We would encourage you to book EARLY if you want Dean Alan. His available dates fill up quickly. He schedules things as far as a year in advance. Dean’s show is totally self-contained, he won’t need anything other than a space to perform and the audience! He has no live animals so you need not worry about children and allergies. He brings plenty of fun and excitement for everyone to enjoy. Great magic, laugh filled moments, and on top of everything else, he is super easy to work with!!! WE are booking dates for Summer 2019. There are only 6 mornings left, and about a dozen afternoons. Contact us now before they’re all gone. NOW is the time to join the multitudes of clients who book Virginia Magician Dean Alan, again and again. All you have to do is start with the first show! 🙂 There are two ways to proceed: Call us 703-404-8902, or hit the contact link! Dean has shows for almost every month of the year. He has educational shows, just for fun shows, and themed magic shows. The image below shows just a few of the programs and he’s always adding more to the line-up. Do you like Dinosaurs? He has The Jurassic Magic Show. Looking for something to do in November? He presents The Thankfully Fun Show, the only magic show about Thanksgiving! He even has The Fall-O-Ween Magic Show which is a Halloween show without all the scary stuff! Sign-Up for the e-promo-kit below and you’ll get more in-depth info on all the shows! Just fill out the form to the right. By doing so you’ll be taken to our e-promo-kit with more in-depth information on all the shows. Plus, just for signing up for the e-promo-kit, we will automatically hook you up to receive our monthly e-newsletter. 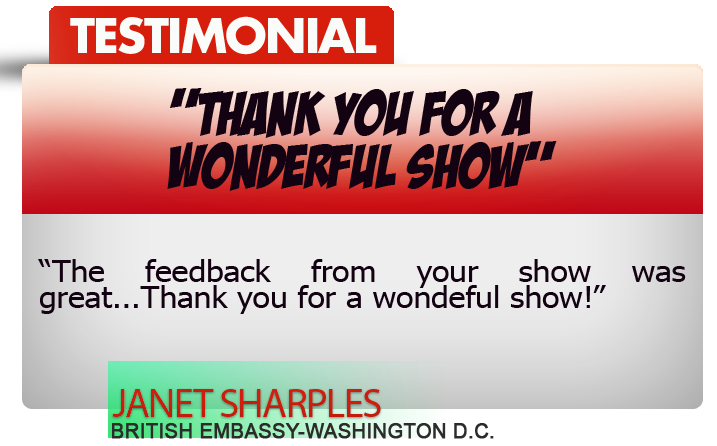 The e-newsletter contains information on new shows, upcoming appearances, as well as occasional tips and marketing ideas to help you in your business. 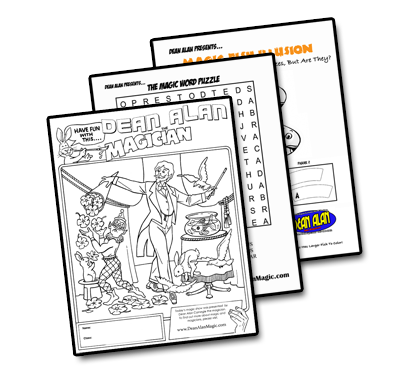 AND, We’ll Also Send You A Set Of My Fun Activity Pages as a Free Gift! 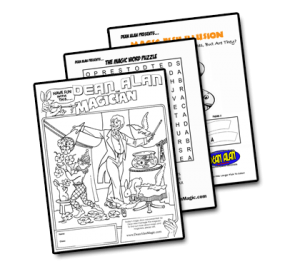 You’ll get a Coloring Page, A Word Puzzle and a Magic Fish Illusion. All FREE just for signing up for the e-promo-kit! 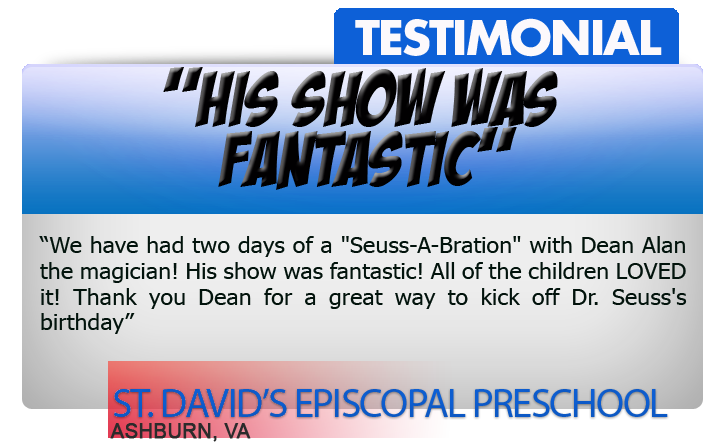 Dean Alan is the premier Kidshow entertainer in the Mid-Atlantic region. He has presented thousands of shows for the daycare market. He has performed for every major chain in the area as well as hundreds of independent and church daycares as well. But he’s not just a daycare magician. He performs at elementary schools, libraries, community centers, fairs and festivals, and many more places all over the state of Virginia and beyond. Below is just a sampling of places Dean Alan has performed at. 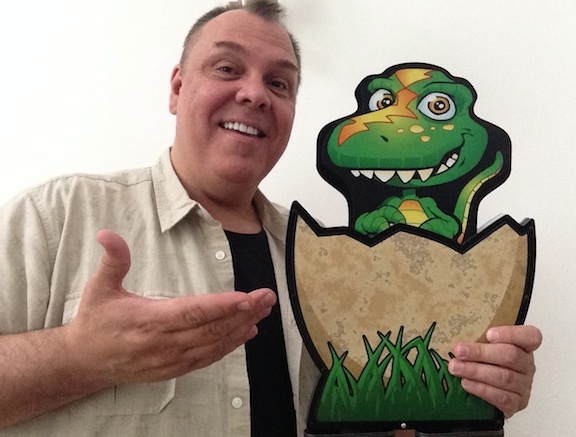 Dean Alan is one of the busiest and best Northern Virginia magicians. He performs regularly in Virginia, Maryland, D.C. and all over the Mid-Atlantic Region. His interest in magic began many years ago when he saw the Tony Curtis movie about Harry Houdini. Only days after seeing the movie he went to the library and began to check out books on magic and magicians. Shortly after this interest began, he and his family moved to a horse farm in the country. With no neighbors nearby, it gave plenty of time to practice and learn magic. Before long he was doing shows at his high school, at fairs and festivals and special events. Dean is a graduate of the Chavez College of Magic. He is a past president of the Society of American Magicians Assembly 252, and past regional vice president for the national Society of American Magicians. Dean Alan is the most popular magician at daycares in the region. When he presents educational assemblies, he performs as The Wizard of Reading. You can catch Dean Alan at area libraries, community centers, recreational centers and parks and more. Most of Dean Alan’s work is private, for schools and daycares. However, occasionally he performs at public venues. We will list any public dates that Dean has here on this page.